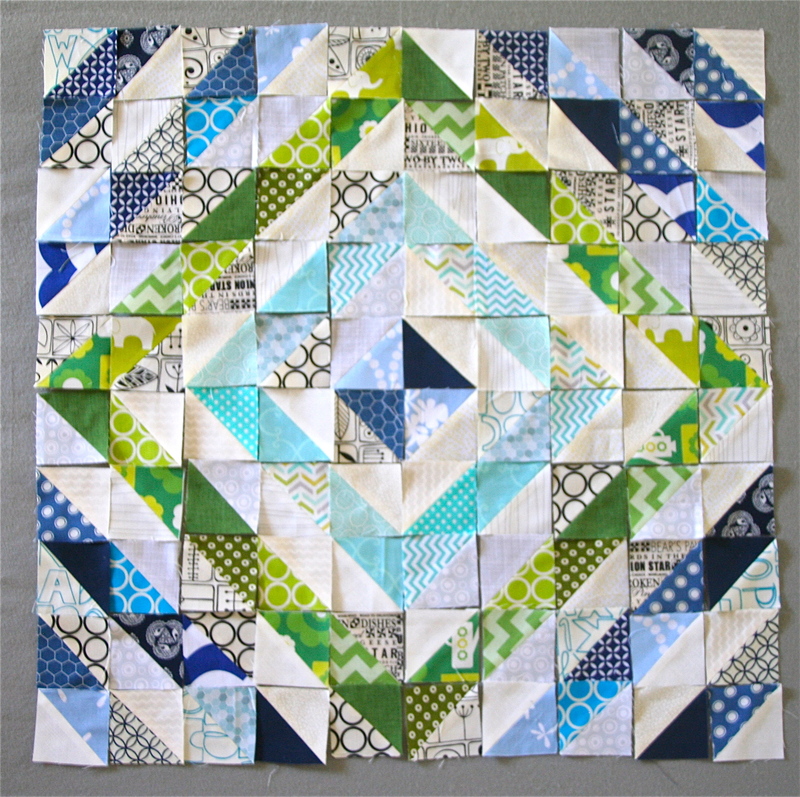 When Jennifer posted on her blog about the modern mini quilt challenge, I was so excited and couldn’t wait to join in in the challenge. 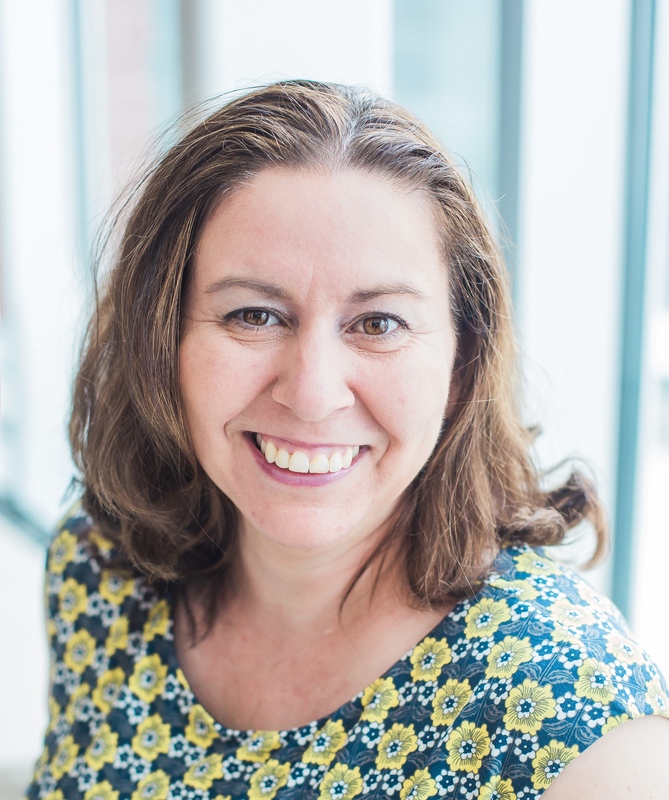 I love small projects – what a perfect challenge. Now to decide what to enter. I am so torn between my Sea Spray Pillow and the Wonky Universe Pillow, pictured below, respectively. I loved both but for different reasons, and they both had new techniques/skills I learned, each were a special gift and had a special meaning. Hmmm…. choices, choices. This pillow was a gift for our pillow swap last Sunday. 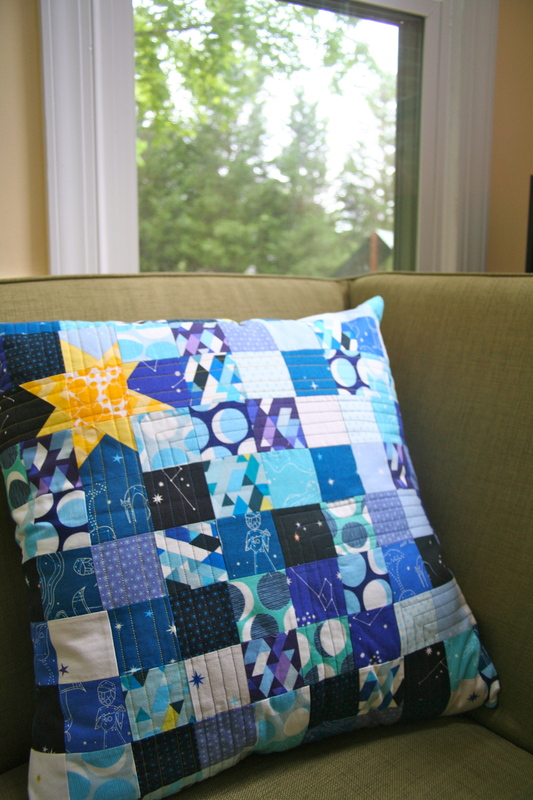 It was based on the “Crystallized” pattern in the book Pillow Pop. This was a challenge for me as it was the first time I have used HST’s, so I was so nervous about cutting them perfectly and matching them up. I used some techniques that Adrianne @ On The Windy Side had shared with me, to get pieces to be more accurate…specifically I took the time to cut them carefully and measure a few times, used my 1/4 inch foot and pinned each seam. I couldn’t have asked for a better finish !!! 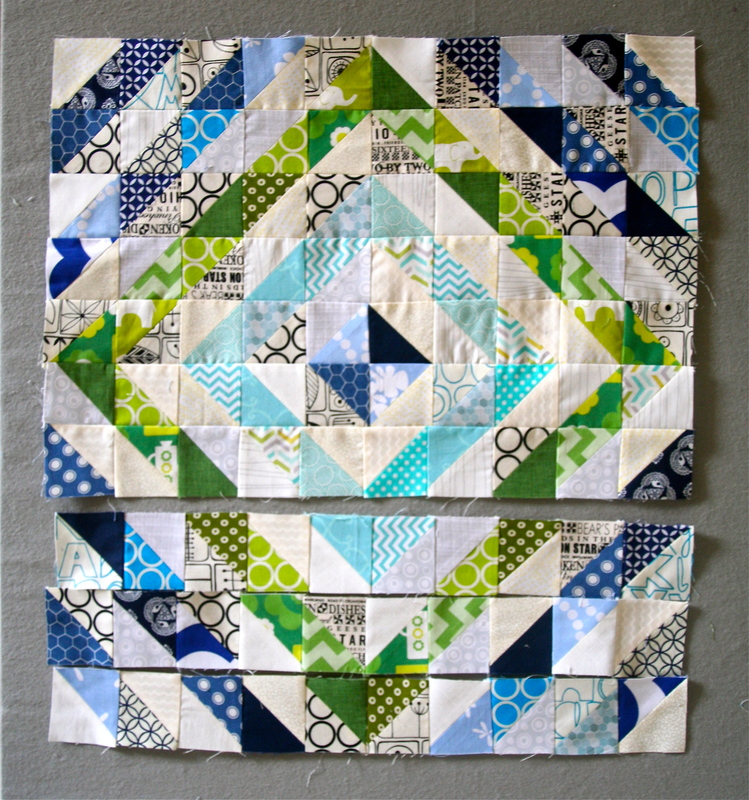 Cut out 100 x 3 ” squares, 50 low volume and 50 blue, green or aqua. Choose one light square and one dark square. 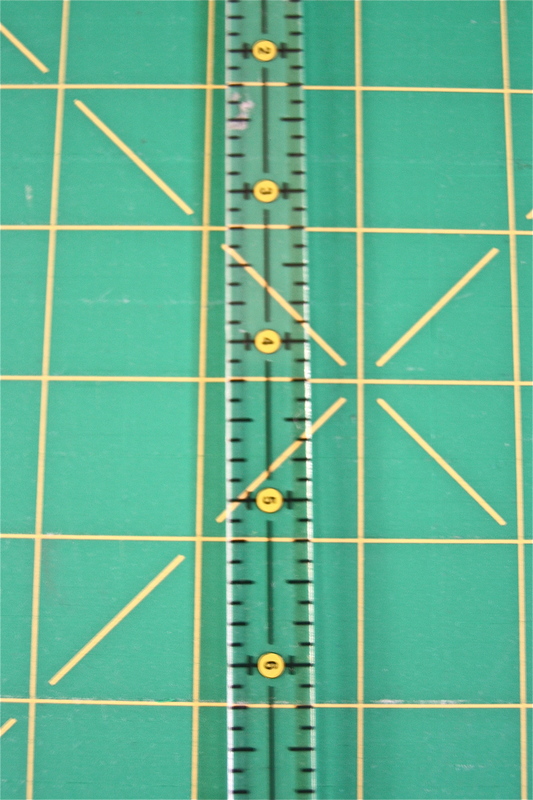 I used a 1/4 ” seam ruler – which I used to line up the middle along the diagonal and marked a 1/4 ” on each side. I then sewed on each of these two lines. Cut down the middle of these squares, between the seams. Press the seams, I like to press each seam to the side. Trim the corners. The squares should measure 2 1/2″. Use a design board to lay out your design. 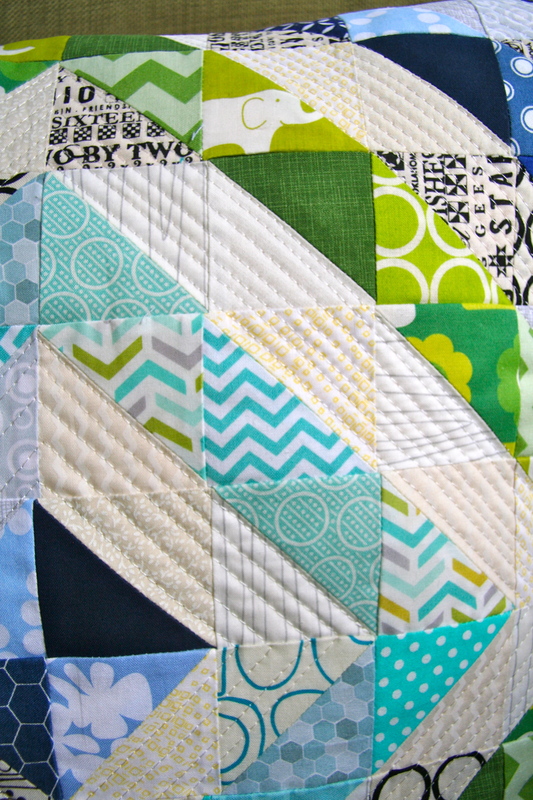 Start at the top row and sew each square together using a 1/4 ” seam. This is where my new 1/4 ” foot came in handy. Keep sewing each row until finished. Press the seams but each row I pressed the seams in opposite directions in preparation to matching up the rows. Once you have the each row finished and pressed, take the first two rows and I pin each of the seams together so the seams match. I start from the middle and make my way out to the edges. 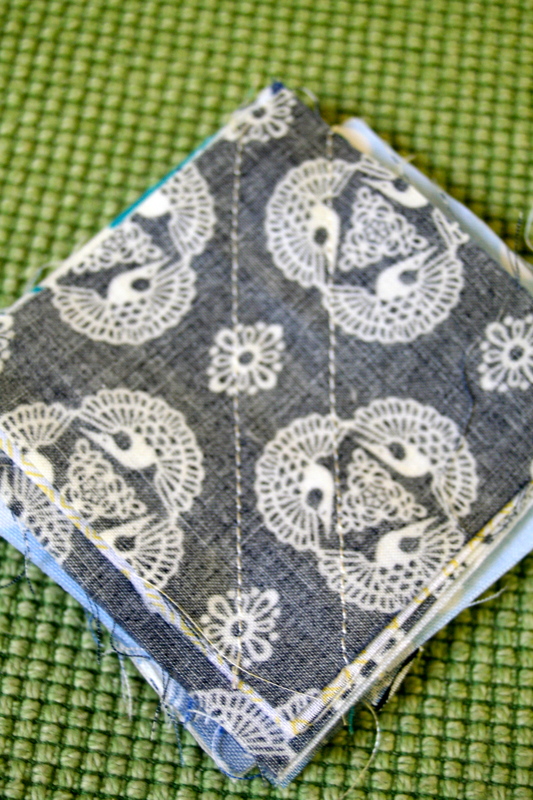 Once pinned, sew a 1/4 inch seam. Repeat by adding a row to the block at a time. Press after each row addition. 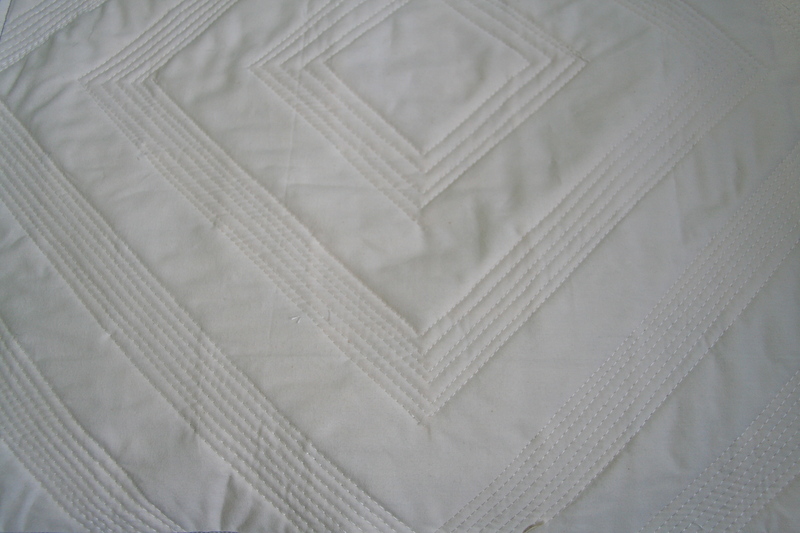 Once the top is complete, I used cotton batting and a piece of muslin (each about 21″ x 21″) to produce my sandwich I was quilting. 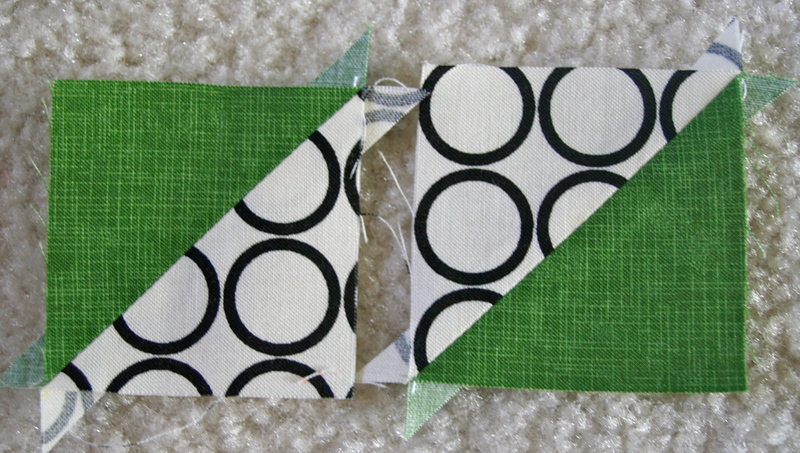 I decided I would sew irregular distanced lines (about 1/4 inch apart) around the low-volume areas. Here is a view of the back of my quilted front, after pressing. Once you have finished the front, its time for the back. I love invisible zippers sewed in the middle of the back. I used two pieces of blue Kona fabric that is 21″ x 11″, and sewed each piece of fabric to the invisible zipper following the instructions using my invisible zipper foot. 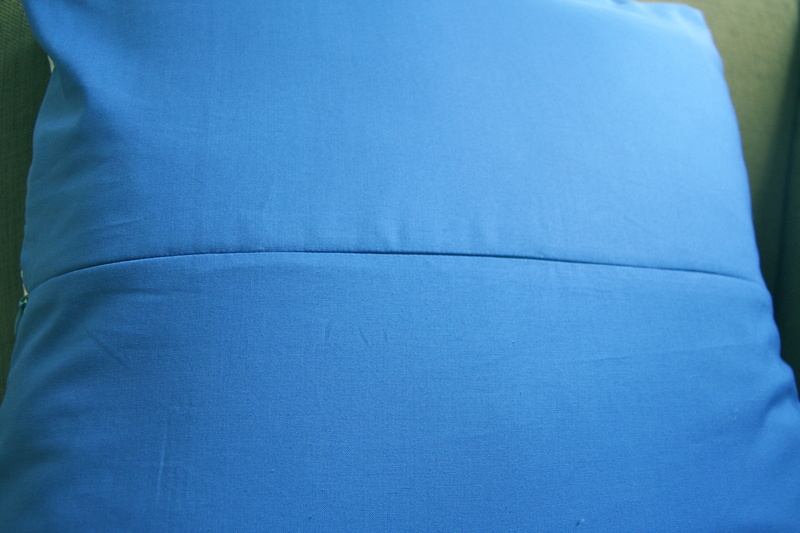 Once I have the zipper in, I trim all the edges to 20.5 ” x 20.5″ pillow. I pin the right sides together with the zipper being open to the middle. I then sewed a 1/4 ” seam along all the edges and double seam across the zipper one each side. That’s it – turn the pillow in the right way and iron. 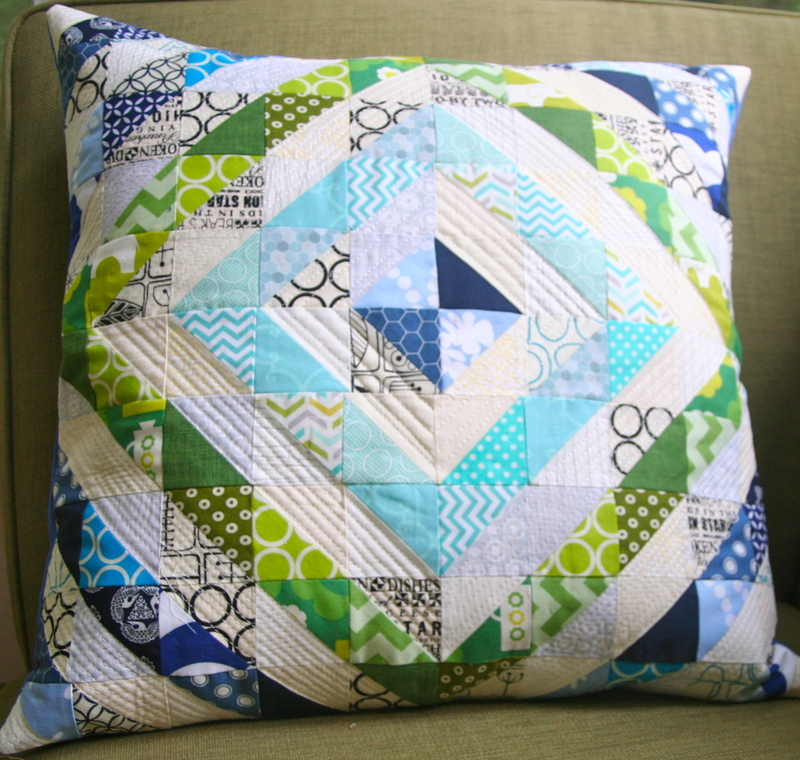 This entry was posted in Uncategorized and tagged cushion, Half Square Triangles, HST, HSTs, invisible zip, invisible zippers, modern mini quilt challenge, patchwork, pillow, Pillow pop, quilting, Sea Spray, sewing, wonky universe on June 14, 2013 by mlwilkie. It’s really lovely and a great choice! Congrats! 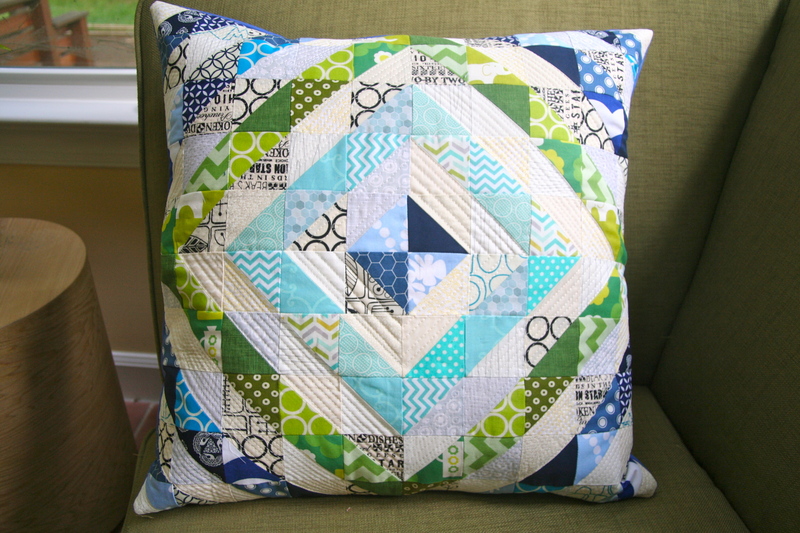 Thank you – I love making the pillows….nice quick projects that you can get done in a week at most. Thank you for sharing! I have some new ideas just from looking at your photos! Thank you – the HST’s were so much fun…the laying out on the design board which I had not done before was a big thrill…I never knew that the cotton would stick like that to flannel with nothing else. I haven’t tried a design board before – I think it might be time. Both are so pretty but I do have to say I love the one with the Wonky Universe! It speaks to me. Thanks for entering the challenge!